Treading further the paths of inversion that Johnson cuts for his characters, Rose provides us with another counterpoint to one of Star Wars’ more storied traditions — disdain for the rough, lower-class world and admiration for the sparkling opulence of the upper-class world. It is of course core to Luke’s aspirations in A New Hope, couched in his dismissal of his homeworld as “the planet that is farthest from” that bright centre to the universe that serves as the key location for the prequel trilogy. This contrast is repeated in The Phantom Menace as Anakin is propelled from slave slums to loitering around Senator Palpatine’s lush digs. Johnson picks a more specific moment to parody though — Obi-Wan’s summation of Mos Eisley as a “wretched hive of scum and villainy.” We cut from Rose’s similar quote in reference to Canto Bight to the reveal of enormously wealthy dilettantes and high-rollers. Rose’s distaste for the location is unpacked as we are introduced to it, a foil for Finn’s wide-eyed excitement. For her, this den of war profiteers is almost a personal Death Star, emblematic of everything she sees as problematic in the galaxy. Her profound hatred for this brand of commercialized apathy for the struggle against total evil anticipates the lack of response to Leia’s later call for help on Crait; to her, inaction is as criminal as the brutal acts perpetrated by the First Order itself. And it is from railing against the construct of Canto Bight that she derives the greatest satisfaction — “Stop enjoying this!” protests Finn as the fathiers are liberated, but for Rose the mere necessity of this action for their survival is not sufficient. It becomes “worth it” once the last fathier is freed of its burden and allowed to live unencumbered. This consideration for the broader concerns the galaxy in action is, again, unique to Rose. If Rose were a Jedi of the prequels, she would free the slaves, jurisdiction be damned. If she were on Kashyyyk as Order 66 unfolded, she would band together with the Wookiees, perhaps at the expense of her life. She might have even considered freeing other prisoners in cell block AA-23. It is vital too, to note that Rose differs from other Star Wars heroes in that she is completely unsentimental with regard to the past. Anakin agonizes over his own origins (“I hate sand”, etc), Obi-Wan and Yoda are devout traditionalists clinging to an ambiguous prophecy, Luke is stoked by the shadow of his father’s accomplishments, and even Han’s adoration of the Millennium Falcon is paramount. So too is Rey chasing a myth, but Rose, like Luke in The Last Jedi, has a more dispassionate view, parting with the pendant that represents her bond with her sister as if it were nothing. Rose internalizes whatever pain that may cause and moves forward; she is not trying to reconstruct something that is gone forever, but trying to shift the future into something better. She is not an adherent of restoring the Republic as the Alliance was (and as referenced explicitly by Holdo), but of building something new. Although she speaks of putting her fist through the entirety of Canto Bight, this is only partially manifest in her actions. Like Luke (and unlike everyone else), she too treads a path of nonviolence, even if this is subliminal and not an active choice — notably Johnson thwarts Rose’s one attempt to kill by giving Phasma the only useful stormtrooper armor ever. Just as with Rey’s errant dash to redeem Kylo Ren, we see the galaxy’s failure to interpret the sacrifice of Anakin Skywalker properly, and take only the act of killing Palpatine itself without grasping the full context. Rose, though, embodying the values that Anakin only spoke of and never enacted, rejects wholesale this concept of martyrdom and looks to the bigger picture. If there is a future to be had, it is one with Finn in it, not one without. Again this is metaphorical and not literal: people of Finn’s character, people with complex, qualified, but genuine bravery in their blood and the moral fibre to reject the institutions that they were born into are going to be at the heart of a movement that changes things. Blowing up yet another derivation of the Death Star, as is the tradition, does not change anything, it only prolongs the inevitable. 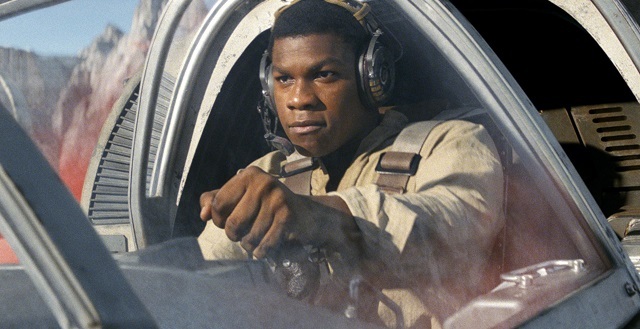 Rose saving Finn, combined with Luke’s nonviolent delay of Kylo Ren, forms the point at which the Star Wars story has broken from its cycle and entered new territory. More importantly, it justifies this new trilogy, and positions it as a criticism of Return of the Jedi’s rather rote resolution to the war by blowing things up on the grandest scale. In fact, Johnson here criticizes most major franchises, and asks if we can’t find a more intelligent way to resolve stories than through carnage and suicide. The impact of Rose and Luke’s choices on the galaxy is evidenced in the final scene, with broom boy Temiri Blagg — a slave in the heart of the most apathetic and cynical place in the galaxy, where the policemen dress up like Darth Vader — dreaming of becoming a hero like Luke, yes, but also while wearing Rose’s starbird ring. The ring itself is a reference back to Casablanca, where an apathetic cynic profiting from conflict is inspired into action by an ideologically-driven character fighting for a higher ideal. The final scene of The Last Jedi doesn’t happen unless Blagg experiences Rose’s gambit of freeing the fathiers – his world is changed, his view of what he is capable of has changed and his mind is opened to the possibilities of what could be. That it is changed by one who is ostensibly “ordinary” yet driven by unshakable ideology is as powerful and vital a message as Star Wars has ever mustered.